Punch Shoe Polish Neutral Carnauba Wax 40ml - DDW Online. Contains Carnauba Wax. This shoe polish consists of a special blend of natural waxes including carnauba wax which nourishes and protects the leather whilst proving a high gloss shine. First class free delivery !! 1-2 days delivery times. Flavour:CHERRY LIGHT TAN 50ML. 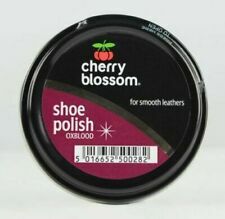 Cherry Blosssom Shoes Polish For Shoes Boots. Available in black only.Suitable for all smooth leather footwear. Ø Ideal for polishing smooth leather. Ø Provides a high-gloss finish. We will always try to handle your queries as quickly and efficiently as possible. 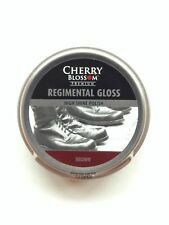 50ML TIN CHERRY BLOSSOM SHOE POLISH OXBLOOD. HIGH QUALITY CHERRY BLOSSOM PRODUCT. TRADITIONAL POLISH. PROVIDES A LONG LASTING SHINE. An 80g black shoe polish. Carefully blended ingredients preserve and soften. Traditional formulation that waterproofs leathers of all colours. 80g Tin with Opener. Jump Black Shoe Polish. DVD's identified as "Region 2" are playable in Region 2 DVD players only. All CD's and DVD's described as good / very good / excellent condition are given a visual check to confirm the condition of the disc. 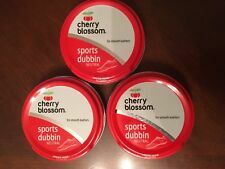 Cherry Blossom Traditional Shoe Polish - 50ml Brown. Dasco RENOVATING and TRADITIONAl wax polish!Worlds number one shoe polish brand! Product Description Cherry Blossom Polish Bags Accessories Accessories. Cherry Blossom Tin Polishes, Traditional And Classic, Made In The Uk Since 1906. - This Product Has Helped Make People Look Smart And Ready To Impress For Generations Upon Generations. - Cleans, Restores And Shines All Kinds Of Footwear. Colours - Light Tan. 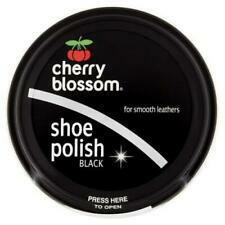 Cherry Blossom Shoe Polish 50ml Dark Tan. Size: 50ml. Camping Online Ltd. Camping Stoves. Camping Lanterns. Camping Furniture. Camping Toilets. © 2018 Camping Online Ltd – The Outdoor Experts. Cherry Blossom Polish Bags Accessories Accessories. Cherry Blossom Tin Polishes, Traditional And Classic, Made In The Uk Since 1906. This Product Has Helped Make People Look Smart And Ready To Impress For Generations Upon Generations. Big 80g tin to clean, shine and protect your shoes. Superb value tin of quality black shoe polish. BLACK SHOE POLISH. Rub polish with a soft cloth, allow to dry, buff to a shine. Provides a long-lasting shine and increases water resistance. High quality polish for smooth leather. Remove dust and dirt Clean with Premium Form Cleaner. Give your shoes a dazzling shine and unbeatable protection from scuffs and scrapes with this long lasting shoe polish. Compact tin.